IPL 2019: Dhoni and Iyer look to be upbeat ahead of the DC vs CSK fixture. IPL 2019: Move over cricket or football building up to a cricket match! 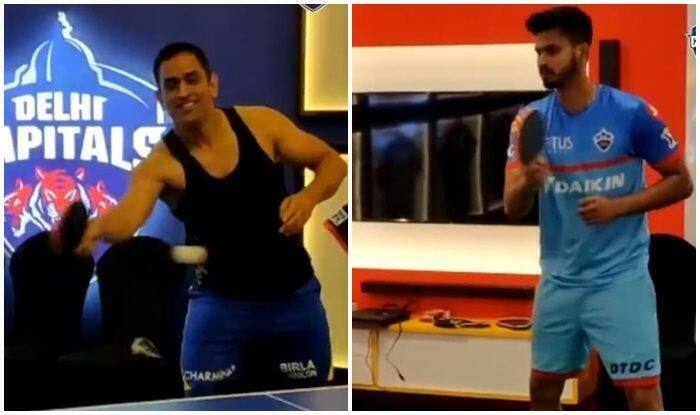 Table-tennis seems to be the new flavour, MS Dhoni and Shreyas Iyer engage in a tussle over the table. Both the players seemed to be doing their counters as Dhoni flaunted his perfect forehand top-spin, whereas Iyer was left to doing the returning bid. MS Dhoni and Shreyas Iyer, captains of their respective IPL franchises will lock horns against each other in a mouthwatering battle. DC will host CSK at the Feroz Shah Kotla on March 26. So, what was the eventual score? According to CSK’s official Twitter handle, Dhoni won the match 7-0. Meanwhile, both the teams won their opening encounters with ease as CSK beat RCB by nine wickets in the tournament opener, whereas a new-look Capitals beat Mumbai by 37 runs.